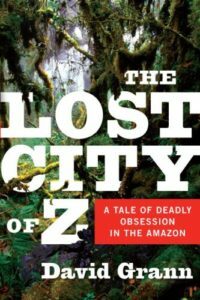 The Lost City of Z – While traveling, I’ve picked up the book the movie is based on (which I haven’t had time to see yet). It’s a fascinating read that hits different levels of interest, from mystery and adventure, to history and anthropology. Being someone interested in all of the above, I find it very compelling. I must admit it’s oddly structured – chapters start as strict narrative, often feeling fictional, and then move to a more biographical/historical structure – and that took a bit of getting used to. But I find myself wanting to read just one more chapter before bed each night, so you know it’s good. iZombie – NOPE NOPE NOPE NOPE NOPE. That jealous outburst from Ravi was the WORST, totally out of character, and I’m so livid about it that it’s burned away the rest of what happened in the episode in my brain (which, overall, I think was fine). 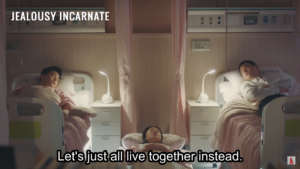 Jealousy Incarnate: Kdrama binge of the past 10 days is Jealousy Incarnate, the show that blew past bromance and put pretty much everyone solidly in ot3 territory. I couldn’t watch this for the longest time because I was spoiled enough to know I would go ride-or-die on the ot3, and also that I would never get it. With a different cast I would never have watched, but I can’t resist Gong Hyo Jin, Jo Jung Suk, and Go Kyung Pyo in the same show together. And they all lived happily ever after together. Shh, let me have this. Plus the missed opportunity to really examine the nature of masculinity and reject traditional interpretations of it as the only interpretations. Oh, and its really gross, clearly not at all thought out minor plot denigrating the validity of asexuality. TL;DR: Watch the show for the cast until about episode 15, and then pretend it ended there. Gin Wigmore: Thanks to a friend’s recommendation, I’ve been playing Gin Wigmore over and over again lately. She’s a New Zealand singer-songwriter who reminds me of a cross between Amy Winehouse and Elle King. Because I’ve been using Google Play I’ve been listening to a mix of all her albums. But my two favorite songs, “Man Like That,” and “Kill Of the Night” (which is also the theme song for Crazyhead, a show you should totally check out that I mention below), are both off her album “Gravel & Wine,” so I’d start there. Crazyhead: Although it’s been almost a month since I finished watching this series, I’ve not recommended it anywhere yet so here’s a good place to do so. If you like Supernatural but are super sick/disgusted of the way they treat women, welcome to Crazyhead. It’s an irreverent, darkly humorous British show about two female demon hunters. If you’ve ever seen Misfits you’ll know what to expect, tone-wise, because both shows are by Howard Overman. Even if Supernatural isn’t your thing, but a diverse cast of women being kickass with a slightly absurdist sense of humor are, definitely check out Crazyhead. It’s on Netflix. Chewing Gum – Hey, Angela, just wanted to digitally high-five you for Crazyhead. We saw it a while ago and it has a great Buffy feel to it. If you’re interested, Susan Wokoma, who plays Raquel in Crazyhead, is also in Chewing Gum, created by the genius that is Michaela Coel. If you like awkward stories of young twenty-somethings trying to find their place in the world, this is a great place to start. Coel’s character, Tracey, is trying to get a real boyfriend and lose her virginity. She’s up against her very religious mother and probably gay boyfriend. There are many moments of cluelessness on her part often interrupted by Tracey’s fourth-wall-breaking turns to the camera. It’s very, very funny. Wokoma plays Tracey’s religious and jealous sister, Cynthia, who is about as far removed from Raquel in Crazyhead as you can get. Season 2 is now on Netflix. Haven – The Syfy series aired from 2010-2015 and is now on Netflix. It’s not a great show, but for whatever reason I was obsessed with it while enduring the last TV hiatus. The acting is okay, and it’s fun to see all of the Canadian guest stars that I see on every show that films in Vancouver. It’s very loosely based on a Stephen King story, The Colorado Kid, and set in the Maine town (of course) of Haven, where people have capital-T “Troubles.” The Troubles are a curse that certain people get, and they are passed down through families. Audrey Parker, played by Emily Rose, is there to help people control their troubles, which are almost always triggered by emotions. There’s a love triangle, time travel, an evil twin, and people with superpowers that can kill. Now that I think about it, that explains why I was so into this show. Plus, it’s great to binge a few episodes at a time, since the show is mostly Trouble of the Week, until the last season, which turns out to be one very long arc. Yeah, the new title is much better. 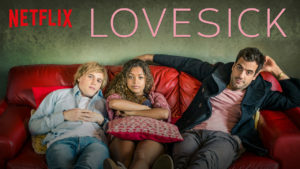 Lovesick – I’m sorry to be so much into Netflix, but this is what happens when you have a 4 year old and can’t watch adult TV until they’re asleep. I’m not sure why there are so many shows about twenty-somethings trying to figure out their love lives on TV, but I guess that’s what the public is asking for. The show Lovesick, formerly known as Scrotal Recall, is an excellent show. (No one watched when it was called Scrotal Recall, so they changed the name. I found the name off putting, so good call on the name change. It made me watch it). The show largely centers around Dylan (Johnny Flynn), who has been diagnosed with an STD and must reconnect with all of his former lovers so they can check themselves out. As you might imagine, there are a lot of flashbacks and at some point I lost track of where so-and-so did this with that guy, but for the most part it’s very well put together, and there are moments in the first few episodes that make sense later on. Dylan’s adventures are complemented by his roommates, Luke (Daniel Ings) a corporate lothario a la Barney from How I Met Your Mother, and Evie (Antonia Thomas), with whom Dylan is secretly in love. The great thing about this show is that almost everyone gets a backstory that makes sense and informs their character. Even Luke gets redeemed. It’s a funny show and a love story, that turns out to be surprisingly poignant later on. It’s super fast to binge since there are only six 30 minute episodes in the first season and eight in the second.